Mid to late June here in Michigan means strawberry season. Once you see those ruby reds you know summer has officially begun. So make the most of the season and get cooking with some lovely fresh strawberries. This Strawberry Cheesecake Trifle is an excellent recipe to get started on. In fact, I only make this trifle when locally grown strawberries are available. It is a beautiful dessert that makes any summer meal special. A plus factor is that it can be made ahead and it is better served a day after it has been made. 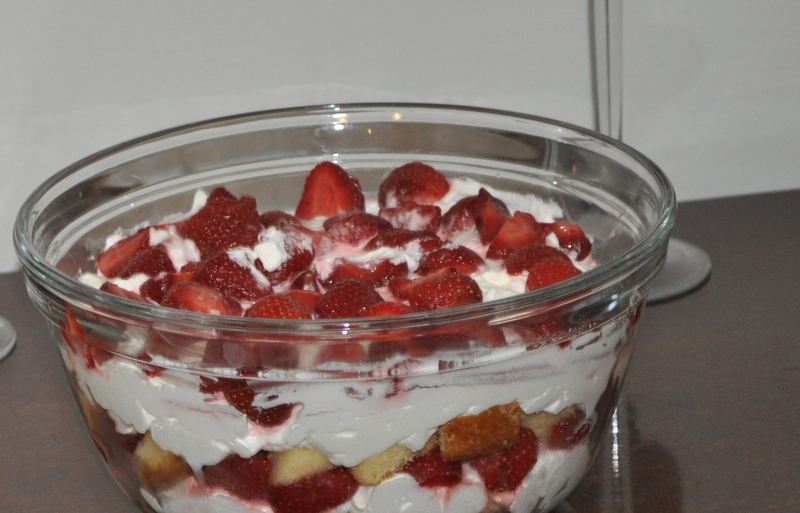 If the local strawberry seasons lasts long enough, I make this trifle for the 4th of July, and it has become a traditional dessert. This recipe is adapted from a recipe I discovered several years ago in a Taste of Home magazine April/May 1999. The original recipe can also be found on the Taste of Home web site. In a bowl, toss strawberries with 1/2 cup sugar; set aside. Let the strawberries stand at room temperature until juices are released, at least 30 minutes. In a bowl, beat cream cheese and remaining sugar until smooth. Fold in the whipped cream; set aside. Drain strawberries, reserving juice; set the berries aside. Gently toss cake cubes with reserved juice. Place half of the cake in a 4-qt. trifle dish or serving bowl. Top with a third of the cream cheese mixture, half of the strawberries. Repeat layers. Top with remaining cream cheese mixture. Garnish with the additional strawberries if desired. Cover and refrigerate for at least 4 hours or overnight.